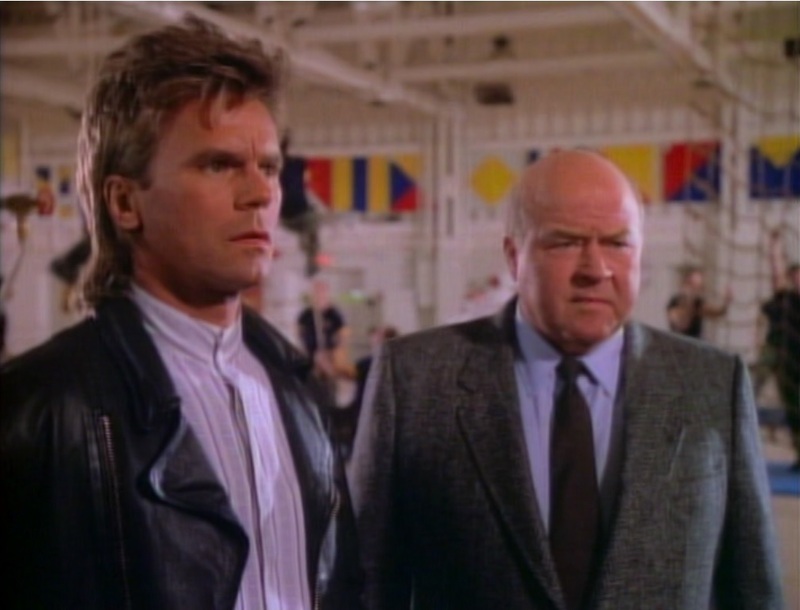 We concluded our look at MacGyver tonight with another one of its occasional Mission: Impossible-style sting operations. This one brings back Jack Dalton as one of the “field operatives” and features a pair of pretty notable guest stars: Vic Tayback and Linda Blair. Tayback plays a local crime boss, which wasn’t unusual for him in this period, and Blair plays the daughter of yet another old friend of Jack and MacGyver’s, who gets killed by Tayback’s character in the opening scene. Richard Dean Anderson gets to play a different role in this story. He poses as a Steve Urkel-like TV nerd called Dexter who whines within earshot of the bad guy’s goons about the impossibility of building the same device the boss already uses to fix horse races, thus starting the sting in operation. It’s a little unlikely, but all done with style and fun, and I was genuinely surprised by the ending. Our son needed a little clarification about what fixing horse races and laundering money means, but he had a good time with it as well. 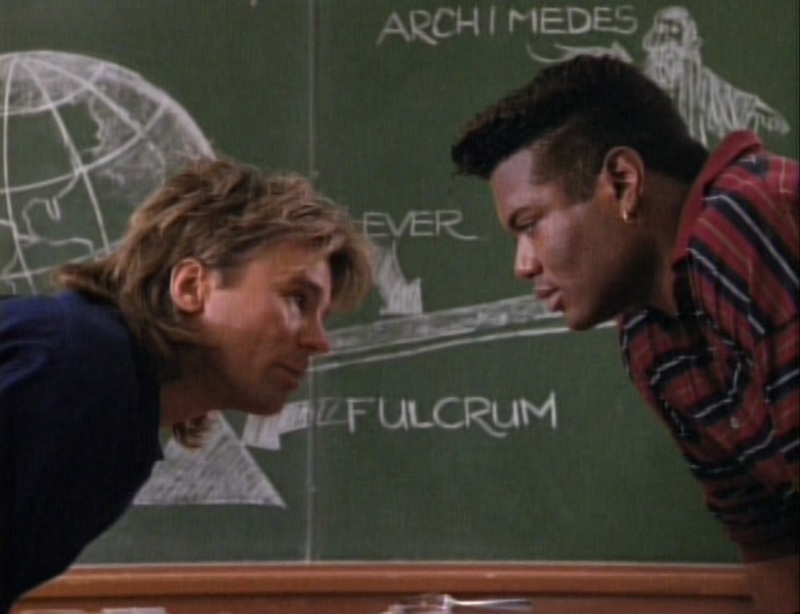 That’s all for MacGyver at our blog, but there will be more RDA in the future. We’ll watch Legend, his short-lived Western from the short-lived UPN network, in about a year, after we watch a couple of other Westerns, so stick around! When we started watching the third season of MacGyver, I expressed a little disappointment that they’d moved production to Vancouver, because seeing eighties L.A. in the background is just so much more interesting. But credit where it’s due: the crew trekked to some remote spot in western Canada for this afternoon’s episode that looks a whole lot more like the mountainous regions of Peru than any place the production might have visited in southern California. So yes, this episode looks good, and it’s a pretty entertaining hour all around. 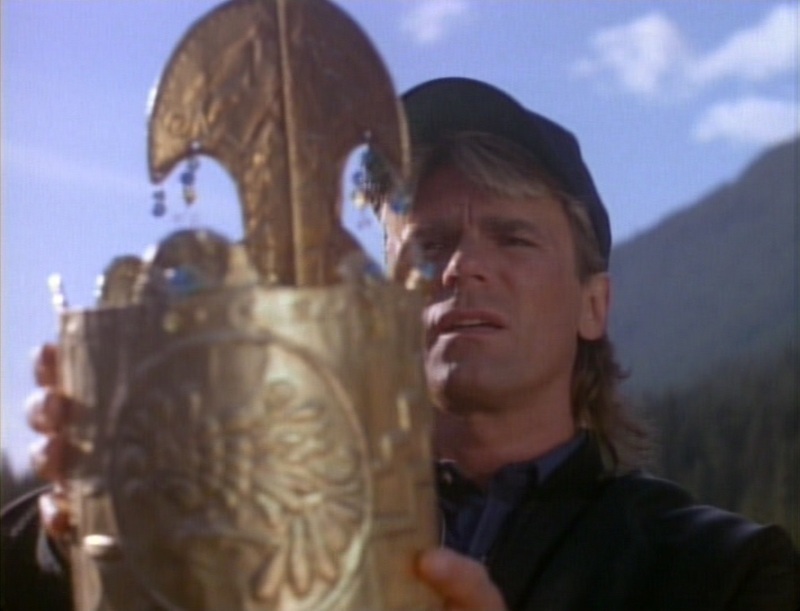 Treasure Hunt MacGyver is always more satisfying than Social Conscience MacGyver. Even though there are a couple of plot “twists” that are obvious from space, this kept our son guessing and it provided a little more evidence that old cultures could build some interesting feats of engineering. His rationale between accepting the archaeological finds of this but questioning the same sort of construction in the first parts of The Feathered Serpent doesn’t make very much sense – if I understand him right, it seems to come down to a question of “how did they know it would work” versus “clearly it did” – but I’m pleased that he’s using his head. Here’s one for the Stargate fans. This seems to be Christopher Judge’s very first screen credit, playing a high school football player in a couple of scenes. Seven years later, he and Richard Dean Anderson would be spending a lot more time than this together in some Vancouver sound stage or other. Otherwise, this is as dire as I’ve seen this show get. It’s another social consciousness story. Stay in school, kids! “Serenity” is a very silly and very cute little change of pace episode written by Stephen Kandel. 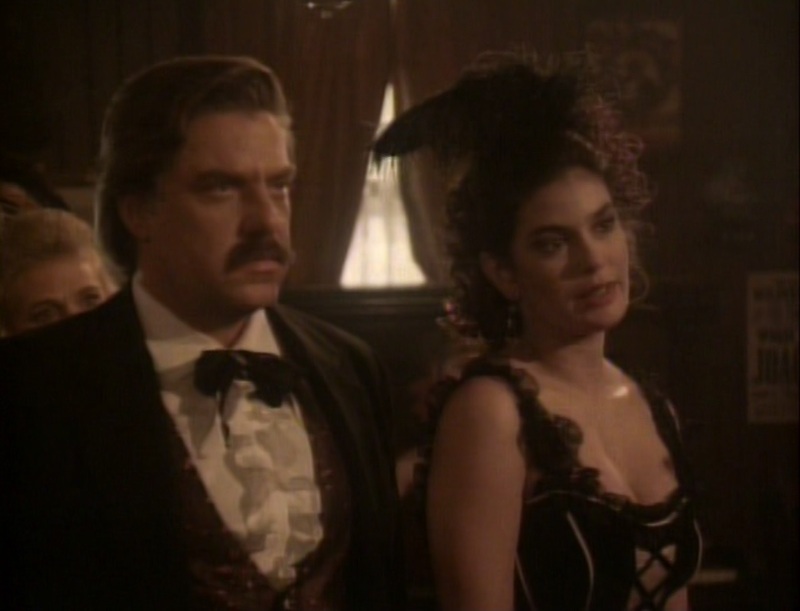 The producers rounded up most of the show’s recurring actors – Bruce McGill, Teri Hatcher, Michael Des Barres – and a couple of players like Cuba Gooding Jr. and Robert Donner who had shown up in other episodes, and shipped ’em off about six hundred miles east to the Heritage Park Historical Village in Calgary to make a western. So of course this is all a dream – MacGyver, exhausted from everybody demanding all of his time, collapses on his sofa in front of an old western VHS – but it doesn’t really matter. 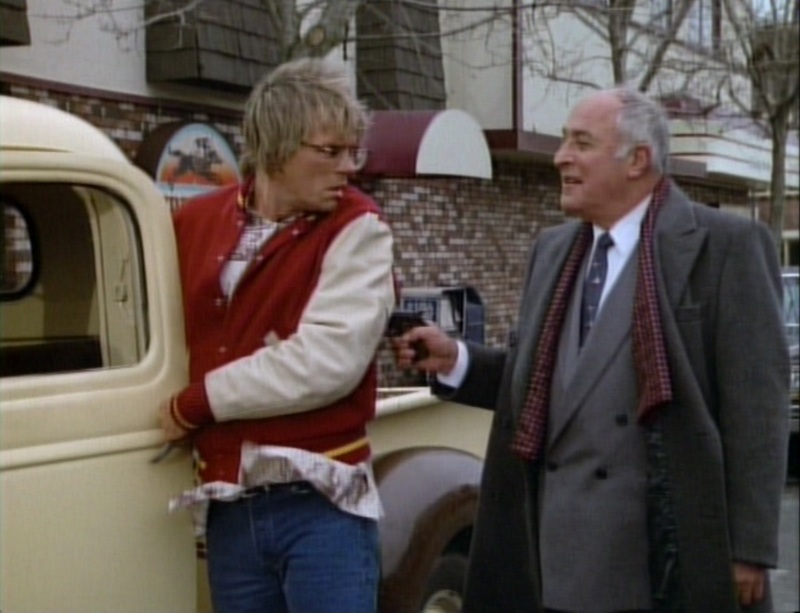 It’s a good excuse to let everybody play roles that are just so slightly different and have a “this town ain’t big enough for both of us” story in which Dana Elcar’s mean and desperate rancher contracts a hired gun – Des Barres, of course – to run MacGyver off the land that he wants. McGill is a “tin horn” gambler and Hatcher is the showgirl with a heart of gold. It’s good fun, with a few very amusing lines of dialogue. Our son enjoyed it a lot, which is nice, because I told him that he’ll get to see Richard Dean Anderson in another western in about a year. He also provided the stunningly insightful observation that with all the snow on the ground, they must have filmed this in winter. One shouldn’t be too sarcastic to one’s children, so we congratulated his deductive reasoning with smiles. Then he wondered whether it might be hail instead of snow. A couple of nights ago, we watched a Young Indiana Jones story in which Indy learns about jazz, and our son was really, really unhappy with the music. He was much more satisfied with the late-80s rock used in tonight’s MacGyver, in which MacGyver looks up another old childhood friend, this one a successful singer. He asks her to join a Phoenix Foundation-sponsored Rock Against Drugs initiative, not knowing that somebody is trying to kill her. Well, I didn’t like the music, which reminded me of something from Heart’s Bad Animals period, but the only other annoyance was a remarkable scene where a doctor at a Chicago-area psychiatric hospital just blabs all about his patient to MacGyver without a care in the world. Even accepting that this was before HIPAA, the guy acts like gossiping about his patients is what he really loves most about his job! Otherwise, this wasn’t bad. It’s got a welcome twist on the weary “old friend” trope and a very well-done scene where MacGyver and guest star Audrey Landers have to climb out of an elevator shaft. Plus, our son got to dance. 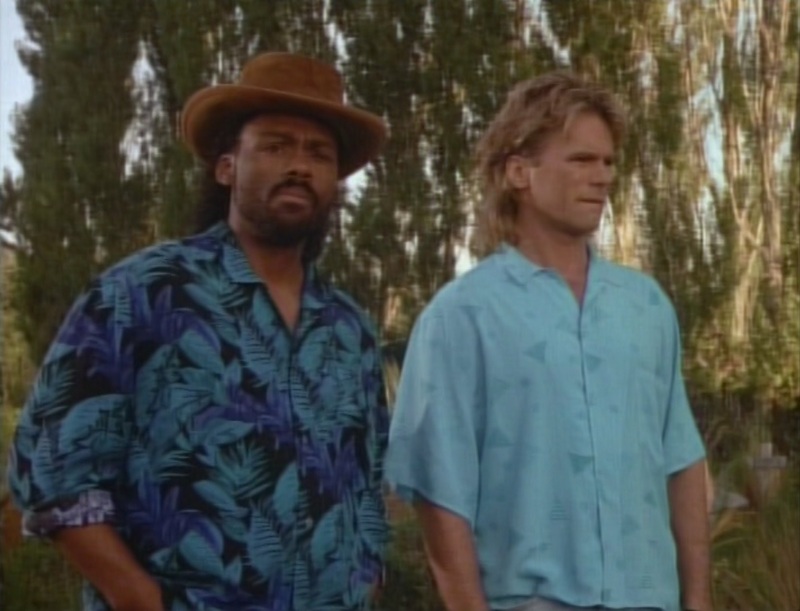 I picked tonight’s episode to get another look at Richard Lawson’s recurring character of bounty hunter Jesse Colton. In it, he and MacGyver are running around Bangkok looking for stolen medical equipment. It’s dire. It’s social conscience MacGyver again. If Little Susie doesn’t get her dialysis machine back, she’ll die, and the US Embassy isn’t getting the visas issued so all these kids can go to America for special treatment, and Jesse has a surprise son who feels that he abandoned him and his dead mother fifteen years ago, and there’s a one-legged dog who inspires everybody by trying real hard. Okay, I’m lying about the dog, but he’d fit right in. Since our son really enjoys MacGyver, Marie and I picked eight more episodes to watch from the show’s fifth season. We’re still watching these deeply disappointing DVDs that look like their source for “digitally remastering” was a third-gen copy on a crappy BASF tape recorded on EP speed, but if you enjoy MacGyver, help is on the way. Season one was released on Blu-ray in October and the results are absolutely amazing. Seriously, look at this. I don’t care enough about the show to invest right now, but if you’re a fan, these new editions are a must. And speaking of not caring… “Legend of the Holy Rose” was the two-part season premiere, shown across two weeks in September of 1989. Richard Dean Anderson needed a haircut in the worst possible way, but part two of this adventure isn’t bad at all. It’s a treasure hunt story, with Lise Cutter as yet another old friend of MacGyver’s that we’ve never heard of before. Interestingly, she’s also an old friend of Jack Dalton’s as well. Cutter went on to star in one of my favorite guilty pleasures when I was in my twenties, a CBS PI show called Dangerous Curves, but I picked this one because Christopher Neame plays the villain, and he’s great fun. But eventually, we get to another part of British Columbia that’s pretending to be a rural area in France for the last big treasure dig and it’s really entertaining. And part two has an incredibly novel and amusing resolution to a memorable cliffhanger where MacGyver’s chained up underneath a big “pit and the pendulum” machine in a chamber of horrors. You’d have thought the museum’s insurance agency would have told them they can’t have an actual giant axe swinging from the rafters. Our son was a little annoyed with us for making him wait about four hours between episodes, but the way MacGyver shut the axe down was clever enough that I think he forgave us. About the only thing I can tell you about Babylon 5 is that the two principal characters from the Centauri world were played by Peter Jurasik and Stephen Furst. Jurasik got to appear in MacGyver‘s first season and Furst got a turn in this one. He plays a nervous Phoenix Foundation scientist whose lab has been infiltrated. One of MacGyver’s old friends has gone rogue and stolen a vial of anthrax. This one’s got spy ninja stuff and dirt bikes and fights, so our son enjoyed it, but it’s all stupidly predictable and tedious, and the story never gives us any reason to hope MacGyver’s renegade buddy comes to his senses. This was a very ponderous hour of television. It’s not, however, the last MacGyver that we’ll watch. I agreed to forty episodes, and we’ve reached that now, but since our son enjoys this show so much, we’ll rotate in a few selections from season five a few months down the line. So stick around, there will be more to come!